The Marine Corps faces serious challenges with its aging CH-53E Super Stallion fleet. The huge and complex aircraft are decades old and tired from 15 years of war. A replacement is on the way, the CH-53K King Stallion, although it is behind schedule and still years away from becoming operational. Yet according to a recent report, the Suprr Stallion fleet is in shockingly poor shape. The Virginian-Pilot newspaper describes an internal report with a damning assessment of just how far the heavy-hauling CH-53E fleet has sunk into disrepair, and how little training their crews are receiving. The confidential independent study ordered by the Marine Corps found a litany of issues, including the fact that force size has dropped to just 146 Super Stallions—50 less than what is needed. If the U.S. were to go to war, even in a limited fashion, nearly every airframe would have to deploy. This leaves nothing for stateside training, contingency operations or war reserve. Making matters worse, major parts shortages and years of deferred maintenance plague the fleet. Most astonishingly, this has led to a readiness of just 23 percent. This is less than one third of the Pentagon’s general readiness target of 75 percent for its military aircraft. With a readiness rate of just 23 percent and just 146 CH-53Es in inventory, only 33 aircraft are actually available at any given time. Getting only 30 flight hours in six months, while on deployment no less, will wreak havoc on a unit’s morale and apparently this is indeed manifesting itself across the CH-53E fleet. The whole situation is further exacerbated by the Marine Corps’ own lack of prioritization: dumping billions into new ultra high-end airframes (MV-22 Osprey, F-35B) while not sustaining the ones they already own and depend on for critical mission sets. The CH-53E fleet has been at war for the last decade and a half. The Army realized just how brutal a toll prolonged fighting in the deserts of Iraq and the mountains of Afghanistan took on its air assets that they budgeted $1.2 million for “resetting” each of its helicopters when they returned from combat overseas. The Marines, on the other hand, budgeted less than a tenth of this amount, setting aside just $100,000 per helicopter to get them refreshed. Now the Marines are paying for this stinginess and lack of foresight in an embarrassing and crushing way when it comes to combat readiness. With failing equipment and low training hours (last year was the least amount of hours put on the CH-53E fleet since 1988) any aircraft community is bound to be dogged with mishaps and crashes. 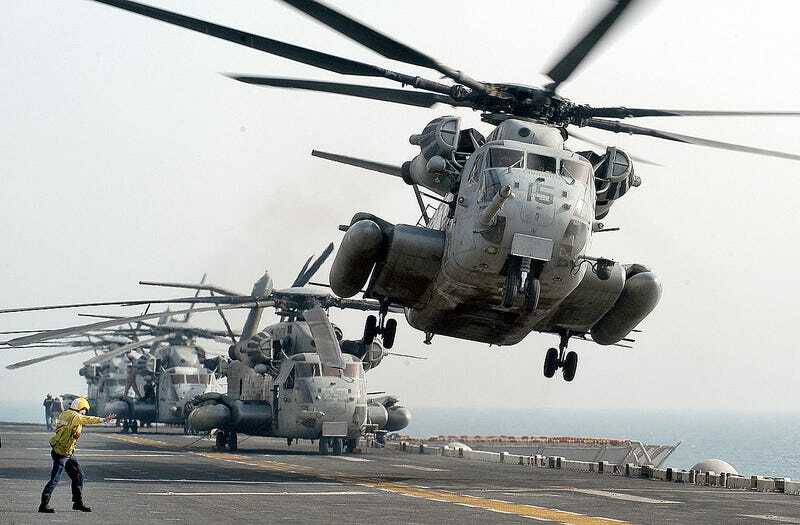 The Navy counterparts of the Marines’ Super Stallion community, the smaller MH-53E Sea Dragon minesweeping community, has been dogged chronically by similar issues in recent years, leading to a whole overhaul of the program. The situation that the Marines’ CH-53E community is in today should come as no real surprise considering the circumstances. Making matters worse, two Super Stallions were just lost off the coast of Hawaii during a night training sortie. All onboard were lost in the incident. As for the CH-53E’s replacement, it is projected that the fleet will not be fully replaced until the early 2030s. If everything goes as planned, the first CH-53K King Stallions are supposed to enter operational status by 2019 with HMH-366 based in MCAS New River. Two hundred King Stallions are planned to be delivered with the last reserve squadron acquiring the type in 2031, at which point the CH-53E Super Stallion is supposed to finally retire from USMC service.